Santa will make an early Christmas visit to Loyola University New Orleans in December to kick off a weekend of musical events celebrating the holiday season. Singing with Santa, a Christmas sing-along for the Loyola community, is Saturday, Dec. 7 at 10 a.m., and the annual Christmas at Loyola concert is Sunday, Dec. 8 at 3 p.m.
Singing with Santa is set for the St. Charles Room in the Danna Student Center. Alumni, family, friends, faculty and staff are invited to enjoy a festive morning featuring the Porta-Puppet Players in a magical show and a sing-along with Santa and Mrs. Claus. The event includes a Christmas cookie decorating station and a professional photographer on hand to take holiday portraits. The cost is $10 per family, which includes one photo, refreshments and all activities. Advanced registration is available online. Christmas at Loyola is free, open to the public and will take place in Holy Name of Jesus Church. An annual tradition of the Loyola community for more than 21 years, the concert showcases the College of Music and Fine Arts' major music ensembles in a program of classical Christmas music. 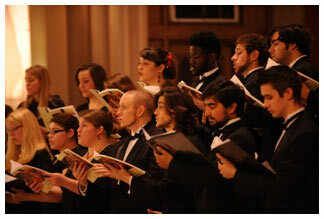 Featuring the Loyola Chamber Orchestra, Loyola Chorale and Chamber Singers, and the Loyola Brass Ensemble, the event also includes a Christmas carol audience sing-along. Free parking for both events is available in Loyola’s West Road Garage, accessible from St. Charles Avenue.